Prepare cake mix according to package directions for a 9×13 cake. Once cake comes out of the oven, allow it to cool for just a couple of minutes. You want the holes to be fairly big so that the pudding has plenty of room to get down in there. Be sure to poke right down to the bottom of the cake. In a bowl,whisk together instant pudding with 4 cups milk. Stir until all the lumps are gone. Let pudding sit for just about 2 minutes so it has just slightly begun to thicken but not fully set, it should still be easily pourable. Pour pudding over cake. Taking care to get it into the holes as much as possible. Spread it all out and using the back of the spoon gently push pudding down into the holes. Put the pudding into the fridge to set and cool. Once your cake has completely cooled, spread on whipped topping. If you haven’t done so already, crush your vanilla wafers. I just place mine in a ziploc bag and crush them with a rolling pin. Leave some of the pieces big. It’s nice to have a bit of a crunch when you eat the cake. Spread crushed wafers onto the top of the cake. You can do this part immediately before serving the cake if you like. This will ensure the wafers are crunchy when you serve it. I think this cake gets more delicious over time. To me, it’s even better the next day so it’s a great dessert to make ahead of time. 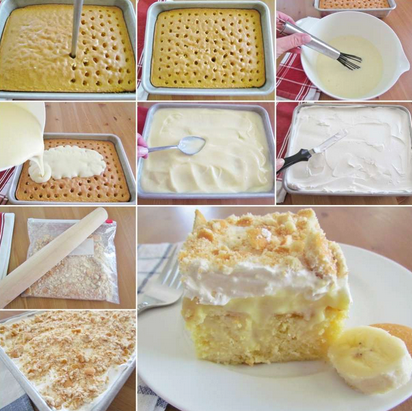 Serve with freshly sliced bananas. Keep refrigerated.